Can Proper Insulation Help Reduce Cooling Costs? Are you aware of how much money you could be wasting on cooling costs due to poor insulation in your home? Summertime often means cranking the air conditioning in an attempt to stay cool when you’re indoors. But without the proper insulation, your cooled air could be escaping your home, causing your energy bills to increase. In fact, having good insulation in your home can reduce your heating and cooling costs by over 40%. So let’s take a closer look at the relationship between insulation and cooling costs. What Are Common Causes of Losing Cool Air? While it may seem like insulation has nothing to do with keeping your house cool, it can play a big role in keeping cool air inside. 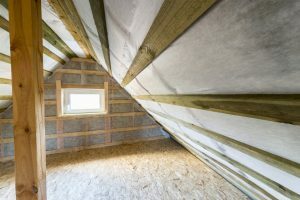 If your attic insulation isn’t sufficient, you have cracks around doors and windows, or your ductwork allows cool air to escape, you could be wasting a lot of money on cooling costs. When cooled air is escaping your home, your cooling system is going to have to work harder to replace the lost air, increasing cooling costs. Fortunately, this is an easy fix. When you have your home insulation looked at, you may find it needs to be replaced. In this case, it’s important to choose the best insulation material for your home. With the best insulation material and proper installation method, you can have a cool, comfortable home without having to throw money out the window. When Should You Insulate Your Home? The most convenient time to insulate your home is when you’re remodeling. Unfortunately, this isn’t always possible if you don’t have any plans to renovate anytime soon. In this case, spring or summer is a great time to consider getting new insulation. If you have plans to get your air ducts cleaned, then talking about insulation then could prove to be beneficial. When you have your ducts cleaned and choose the best insulation material for your home, you’ll be able to maximize your cooling system. So while insulation and cooling costs aren’t always a priority for homeowners, it’s definitely something to keep in mind. With the most reliable insulation OKC can offer, you can rest assured that your home will be cool and your cooling costs will be low. https://ductsquads.com/wp-content/uploads/2015/07/White-Duct-Squads-09-150px-height2.png 0 0 andwhat8371 https://ductsquads.com/wp-content/uploads/2015/07/White-Duct-Squads-09-150px-height2.png andwhat83712018-07-20 20:18:052018-07-20 20:18:05Can Proper Insulation Help Reduce Cooling Costs? When Is it Time to Have Your Dryer Vent Cleaned? Why Should Your Ducts Be Cleaned Before Winter? Why Should You Let a Professional Handle Duct Cleaning and Maintenance?